Mordian 7th Regiment: The most accurately named boardgame of all time - OGRE. The most accurately named boardgame of all time - OGRE. 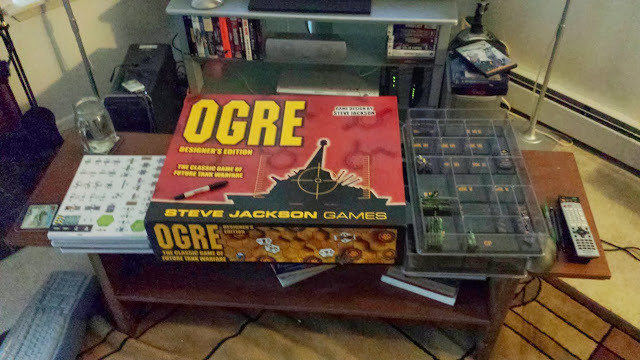 It's not all 40k all the time around the Mordian 7th's HQ, and as I'd mentioned quite some time ago now, I'd backed the Kickstarter for Steve Jackson Games reboot of OGRE. This was back in May of 2012, and the packages finally delivered late last week - bit of a wait, that! However, the long wait was worth it, as the game is absolutely MASSIVE. Weighing in at just shy of 30 pounds, it is truly an ogre of a box! The above picture is the box and just some of the interior stuffing laid out on the coffee table in my living room. The box is 24"x18"x8" and just to give a sense of scale, that's a sharpie laying on the box lid. 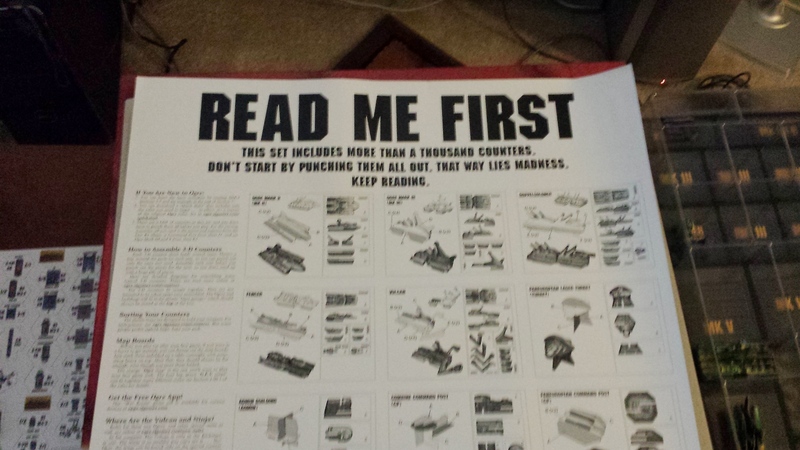 On the back of the box under the shrinkwrap holding all the counter sheets was the "Read Me First" page which definitely garnered a chuckle. They weren't kidding, there are over a thousand counters, and I very nearly did go mad! 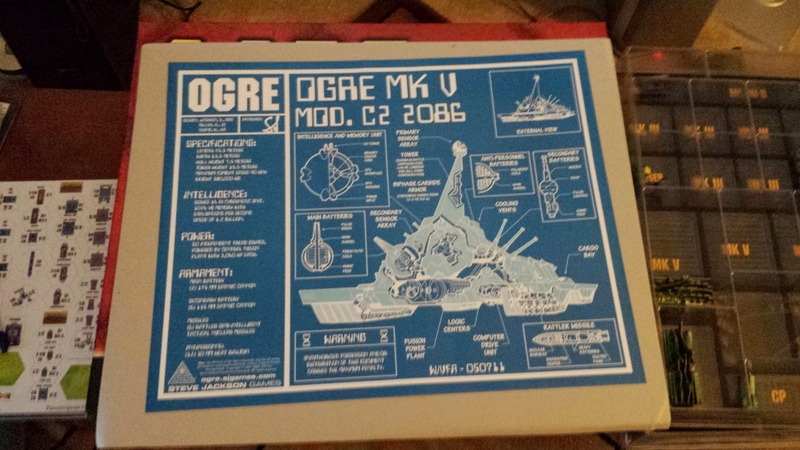 Also included in the box was a reprint of the old-school Ogre Mk V cutaway poster, which I used to own waaaaaay back in the day, but was lost in a house move somewhere along the way. Really happy to have one again! I started punching out counters and assembling cardboard pieces around 4 in the afternoon, and by the time I was finished it was almost 8:30 at night. Pretty crummy lighting for the next few pics, I'll try to get some better ones over the holiday weekend. The game includes several vaccu-formed plastic trays designed to hold all of the 3D counters, which was really a nice touch. 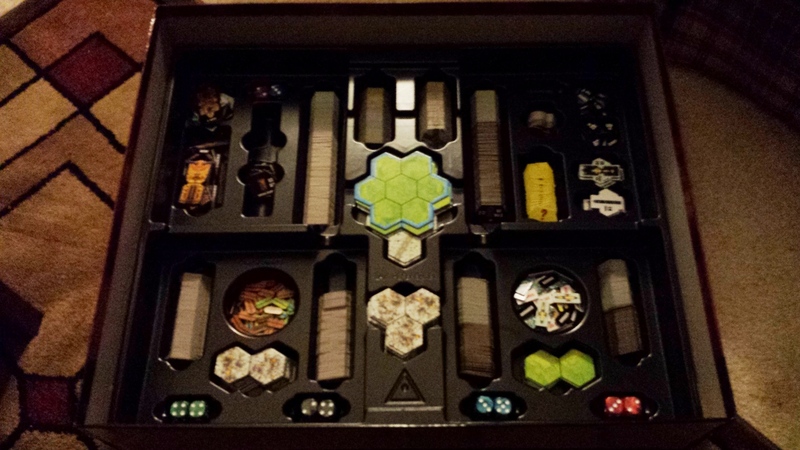 There is also a large tray in the bottom of the box designed to hold all of the flat counters, terrain overlays, maps, rules and whatnot. Very well thought-out design, and I couldn't be happier with it! Hoping to introduce my gaming group to it sometime in the next couple weeks - most of them have never played it before, which is a tragedy that I will rectify soon enough! Wow, that game looks awesome! I never heard of it before, I'll need to read up. The retail version is supposed to be hitting stores over the next month or two, I cannot recommend it strongly enough if you are at all interested in some old-school wargaming. If you've ever read and enjoyed a Keith Laumer "Bolo" novel, you're gonna love OGRE! lol, I never played it either, but yes the Bolo novels always brought Ogre to mind. Wow, a beast of a boxed set! Never played this one, so I'll look forward to any further updates you might post. @Da Masta Cheef: It's probably the best asymmetrical warfare game out there, and a good-sized game can be played in an hour or less. They're supposed to be releasing the "Pocket Ogre" game soon as well, which is essentially a reprint of the 1977 game (with updated rules) and fits in a small-ish ziplock bag, for about three bucks. Definitely, definitely worth checking out! We got 5 copies of the designer edition in at my store last week. My boss backed the kickstarter quite heavily, so there is a LOT of this being played now, haha. I was honestly amazed at how much stuff came in the box. It was just ridiculous. Christ! It looks like it gives Fantasy Flight a run for its money when it comes to tokens! Oh man, I saw this kickstarter when it was out but I wasn't in a position to lay down the money for it. I Have to say, I wish that I had! My problem at the time was trying to cover the $120 postage price to get a copy shipped to Australia. LOL, just too heavy! I'm hoping I manage to find a copy of it somewhere. 30lbs ?!?!? 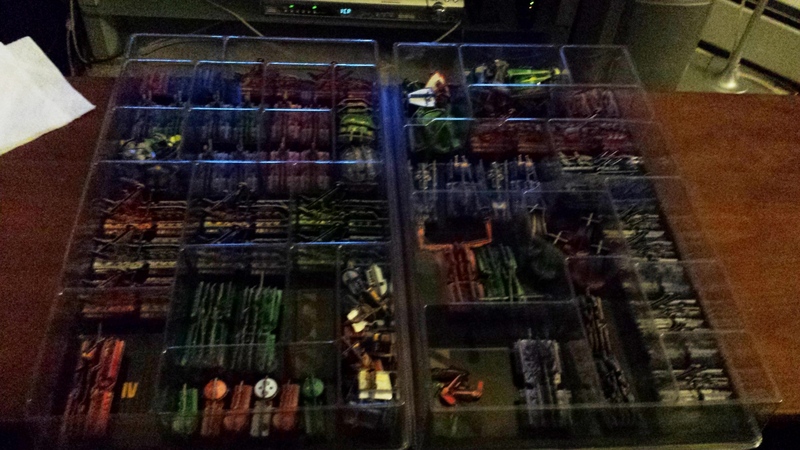 It used to fit in one of those DVD sized cases that Steve Jackson games used to come in ! Looks good though. Tinge me slightly greenish at the edges. @Damn The Valley: Nice! I'm itching to give it a workout this coming weekend. Gonna introduce a number of the gaming group to it for the first time! @Musings of a Smurf: Indeed! The production values are on par as well. 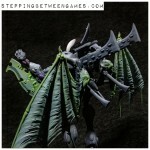 This thing is going to be a steal at ~$100 at retail with all it comes with. @Col. Ackland: They're going to sell it in retail game stores from what I understand, hope you can get your hands on a copy. Pics to follow soon! @Zzzzzz: Totally! Amusingly, the kickstarter version comes with a reprint of the original zip-lock bagged version, huge hit of nostalgia when I saw it. @Zab: Haha! No fear mate - I fired up the batch painting machine over the weekend, pics ahoy!